On Sunday, perhaps the best wide receiver in the NFL informed his coaches that he was retiring from the league at age 30. The most pressing question to arise out of this may very well be: wouldn’t you, if you were him? Backtracking for a moment: Johnson, affectionately referred to as Megatron, has played nine seasons for the Detroit Lions, one of only four NFL franchises yet to appear in a Super Bowl. He has played in two playoff games, both of which the Lions lost. Combine that with growing concerns about what the sport of football does to the human body over time, and Johnson may have just become the biggest star to set a template for exiting the NFL on one’s own terms. But even more than that, he just seemed fed up, like your dad being asked to do some menial tasks after mowing the lawn. Much like Barry Sanders, it seems Johnson has grown tired of giving his body and soul for a team unwilling to surround him with help. For a franchise that withstood the Matt Millen era of drafting wide receivers and ONLY wide receivers in the first round, the Lions struck diamond with Calvin Johnson, the uncompromising physical specimen out of Georgia Tech. 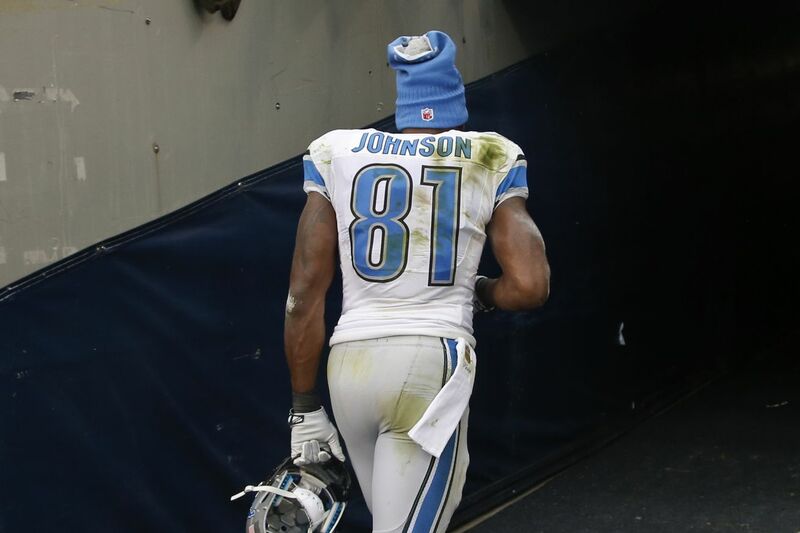 Not without trials would the Lions enjoy the fruits of Johnson’s labors, however. There was the 2008 season, which saw the Lions become the only team in the sixteen-game season to go totally defeated°. There were the many seven-win seasons, in between which only two Lions teams went above .500. Both went to the playoffs. That has to start to wear on a player of Johnson’s caliber, or any player who truly belongs in the NFL. At times, Matt Stafford has been both brilliant and boneheaded, sometimes rocketing passes into space reserved exclusively for defensive backs and low-flying aircraft. A dragging offensive line here, a complete lack of anyone else who can catch there, and Megatron often found himself scrambling against double- and triple-team coverage. The best offense at that point became simply to toss a jump ball and send a thought or two to your preferred deity. Like Sanders before him, Johnson spent his career in an NFL purgatory, doing amazing things against great teams only to watch his own repeatedly fall short. The city of Detroit can’t feel mad at him, not now; if anything, they ought to direct outrage toward their franchise for not bringing him help and toward the NFL for not making the sport Johnson chose to pursue any safer. With scrutiny coming down on football for the increasingly apparent peril in which it places its athletes, Calvin Johnson may very well be the last player of his kind we get to witness. An authority as well-regarded as the New York Times has even gone so far as to appeal directly to parents not to allow their children to play football, shrewdly comparing the game’s long-term health effects to those of smoking cigarettes. Players such as Tony Dorsett and, more severely, Junior Seau have exhibited symptoms of brain damage due to the impacts of football; why bother succumbing to that on behalf of perhaps the most influential political machine in America? Really, though, Johnson just looks tired. Tired of putting up nearly 2,000 yards of offense for a losing team. Tired of scoring at will against defenses who gameplan specifically for him, only to blow coverage yet beat his team anyway. Tired of acquiescing to the physical and mental demands of a game which, with any luck¹, will go the way of the dodo bird within the next half-century. It’s maybe a weak conceit, but one which I can’t escape: Calvin Johnson seems like a dad who, just as he’s finishing up yardwork, has been asked to carry out a few more trivial chores over the course of his Saturday afternoon. This time, however, wiping the sweat from his brow, he refuses the dish cloth, leaves the garbage where it is and instead jumps into his midlife crisis convertible, bound for spoiled riches such as 2-for-1 orange juice and the free guacamole sampler platter at Publix. Calvin Johnson was amazing to watch, amassing almost 1,300 receiving yards per year and several spectacular catches. Depending on whom you ask, football may not be quite finished with him. But he sure seems finished with football, and he’s earned that right. °Seriously though: HOW does a team with Calvin Johnson, even in only his second season, go 0-16? Dan Orlovsky isn’t to blame, but man, he feels like Scott Norwood every time I think about that. ¹And the political backing of someone more powerful than Roger Goodell, the likes of which we’ve yet to see in this country.